After entering the decimal point and the zero, intellisense pops up and when i enter the comma R# completes my input to 0.CompareTo. There are a couple of similar issues. Somtimes i wish a developer would sit beneath me that he can see what happens. It's sometimes hard to describe. I think i will disable R# intellisense until it is improved. R# intellisense doesn't do this. entering, this is a known problem and it is logged under http://youtrack.jetbrains.net/issue/RSRP-185610. I've raised its priority and you're also welcome to vote for that issue. for 10 to 30 seconds while R# is opening the intellisense popup. i've just completed the profiling. Unfortunately the polices at my office don't allow ftp uploads. I will take the files home and upload them tonight. While profiling i had the problem, that the IDE hangs after pressing <Ctrl>-<Space> to explicitely open the intellisense popup. I took a snapshot after around 3 minutes waiting and then went to lunch. When i came back, IDE was responsible. I profiled a second time, now only what happens after pressing <Ctrl>-<Space>, and got an error (see RSRP-242647). The IDE was blocking too but not such long as the first time (maybe 20 to 30 seconds). 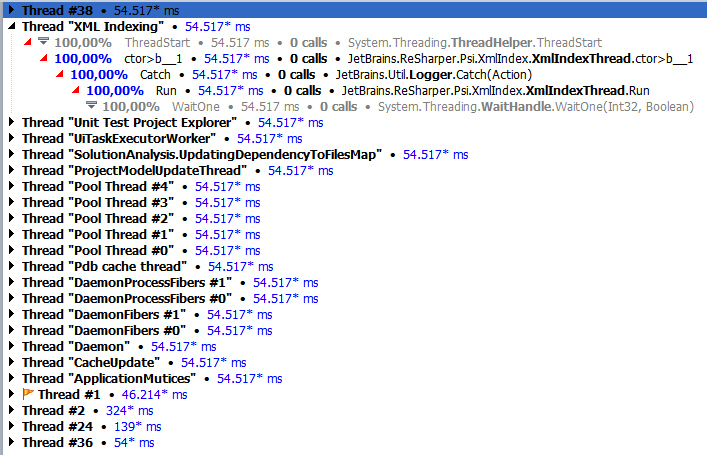 Both snapshots show that most of the time is spend in the JetBrains.ReSharper.Psi.XmlIndex.XmlIndexThread which is just waiting. Maybe this is a starting point for your investigations. Nevertheless, as i told before, i will upload both snapshots when i arrive at home. i hope i've managed it to upload the two trace files. Upload speed on DSL is horrible :|. I'm not sure if the files really arrived because i couldn't see them after upload was finished (used FireFTP addon in Firefox). Nevertheless, the first, larger, file (IntellisensePerformance.dtp) is a snapshot from some edit actions. I copied some source and renamed functions and variables (not via rename refactoring) and at last i opened Intellisense popup explicit via Ctrl-Space. Here i had the 3 minute freeze of the IDE. The second, smaller (IntellisensePerformance2.dtp) is a snapshot of just open intellesense popup. Hope it helps you to investigate the problem. If you need more help, let me know. after upload was finished (used FireFTP addon in Firefox). Today i'm testing how NHibernate and FluentNHibernate can help me to implement my data access layer in a new application. My testcode is written in C# and i'm using the latest EAP build (2137) on Visual Studio 2008. I notice the same weird intellisense popup behavior like in VB. I wanted to declare a property named BearbGrpNr. Popup is shown while entering property name and when i press space after finishing my property name is replaced by "BadImageFormatException" which was the marked entry in the intellisense popup (see attached video). This is a very bad user experience. In VB this problem is solved meanwhile. forget it. I was mixing VB and C# syntax. If i precede the variable name with a type modifier evferthing is ok.